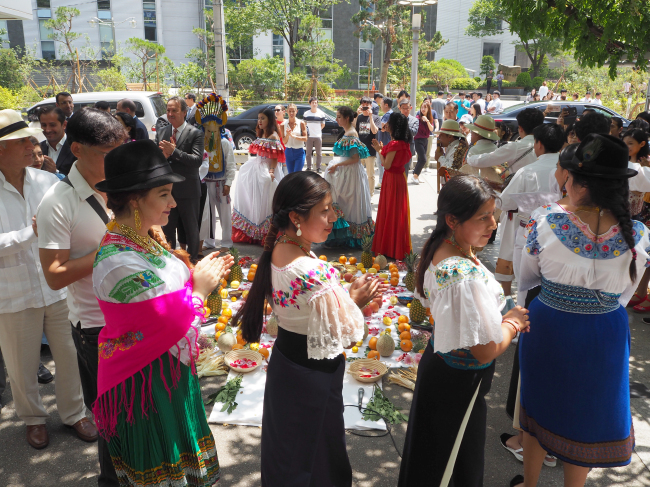 People formed a ring encircling a “chacana” -- a space lavished with artfully juxtaposed fruits, grains and flower petals -- genuflecting, reaching out to the sky and expressing through mystical body language in a mimicry of a ritual leader donning a colorful mask. The theatricals replicated the ceremony of “Inty Raymi,” or festival of the sun, the ancient Incan Empire’s essential rite of passage every year centered on the agricultural cycle and harvest. 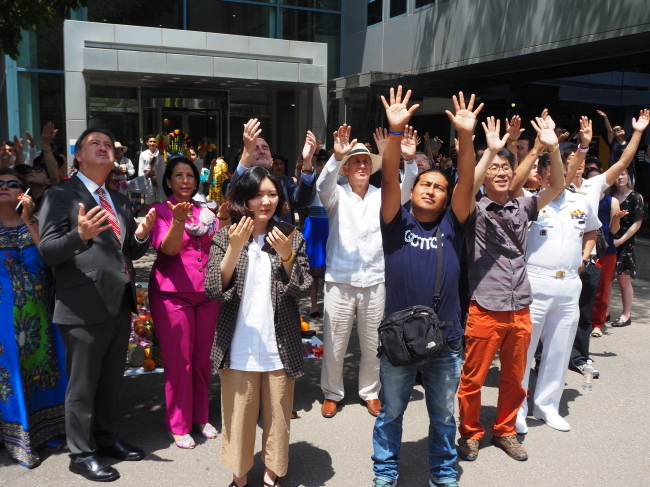 The Ecuadorian Embassy, in collaboration with the World Culture Open, celebrated Inty Raymi in the heart of Seoul on Friday. 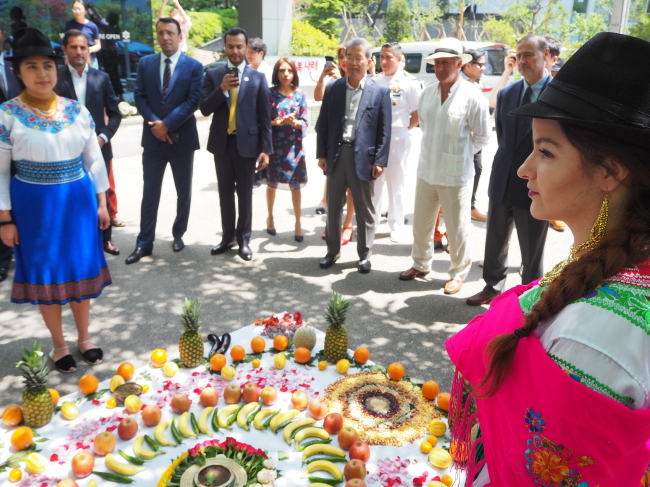 A large crowd of people, including over 10 ambassadors and deputies, participated in the event and watched Ecuador’s traditional music and dance performed by its musicians and students. 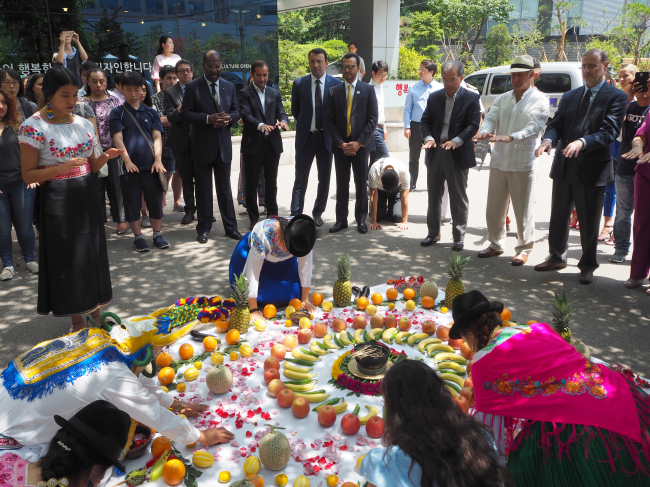 “On behalf of the Ecuadorian government, and with deep respect for our country’s ancient traditions, I have the honor to present the Inti Raymi celebration,” said Ecuadorian Ambassador to Korea Oscar Herrera Gilbert in a speech. With music, dance and gesturing guided by “Aya Huma,” the festivity’s main character, Ecuador’s indigenous communities have feted their harvests annually from June 17-23, he added. The Incan ancients marked the heritage during this time of the year because the summer solstice, with the sun positioned farthest from the earth, creating the longest day, had a special significance for them. As part of the festival, the Incans would pray to their sun god Inti, and undertake rituals and dances to entreat the god to return and rekindle a new cycle of life. Today the custom is preserved in countries that were formerly home to the Incan Empire, the largest civilization in pre-Columbian America stretching from modern-day Mexico to Chile from the early 13th century through 1572. People re-enacting Inti Raymi wear rainbow-colored attire and golden crowns. They, along with a beautiful sun princess, dance to the rhythmic beat of folkloric music, animating the ambiance with gaiety, gratitude and ancestral pride.